Online: Signifies you're available to answer chats. Away: Signifies internally to other agents that you're away from your computer. You can still serve chat requests when your status is Away. If you use the Classic widget, it shows your Away status to visitors. For details on the Classic widget, see Customizing the chat widget. 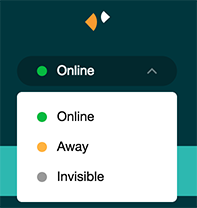 Invisible: Lets you log into the dashboard but not be visible as online. You can still get incoming chat requests and serve chats if you're invisible. If all chat agents are invisible, the widget will not appear online to visitors and Chat triggers will not fire. You can change your status from the dashboard. To change your status once you're already logged in, click the dropdown menu in the upper-left corner of the dashboard. These settings affect only your status, not other agents' in your organization. Note that if you've set up a schedule with operating hours, the schedule overrides your idle timeout settings. For more information, see Creating a schedule with business hours (Professional and Enterprise). In the dashboard, select Settings > Personal. Select the Idle Timeout tab. Select the Enable Idle Timeout check box. If you don't want your status to change when you have open chats, select the Ignore if Chatting check box. Next to Idle Status, select whether you want your status to change to Away or Offline when you're idle. Next to Inactivity Period, enter how many minutes you should be idle before your status changes. The default value is 15 minutes. 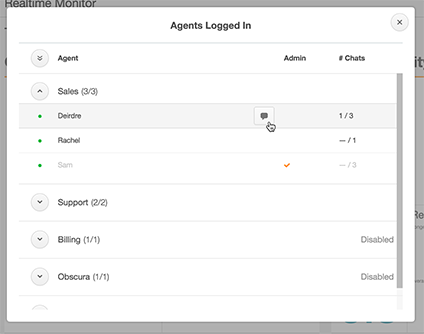 You can see which other agents are logged into your dashboard and online by clicking Team in the left panel of the dashboard. The Agents Logged In window opens, which shows you a list of the agents currently logged in by department, as well as whether they have admin privileges and how many chats they currently have. Is it possible for an admin to set the availability of other chat agents? Some of our agents often forget to set themselves as available. Yes! Being able to change another agents status would be very helpful. Also, what are the parameters for being "idle?" It seems to be logging us off even though we are in the chat module. Agreed - We are a small team so that capability is very necessary. I can control it in 'Talk' why not in 'Chat'. +1 for the ability to edit other agents status. + 1, it comes up quite often that I'd need to change someone's status. Is there a way we can add a widget or API that admins will be able to control the status of the agents. +1 for admins to change agents chat status! Any updates on this becoming a possibility? It would be a very helpful feature! It appears that the auto-timeout is based on the Zendesk chat tab in your browser staying as the primary focus on the desktop. Although this functionality is fine for full-time agents, this doesn't work for part-time agents who only occasionally answer chats throughout the day. It would be nice for the inactivity timeout to rely on Windows Screen Saver (or some other system level inactivity indicator). This functionality was available as part of the native Zendesk Chat, what is the timing and priority to make this available with Zopim? Hi Fernando, Admins have the ability to set the status on behalf of agents in the Talk product, but there no announced plans to replicate this function in Chat. We would appreciate if this feature can be enhanced on the chat product, we are a small company as well and this functionality is very crucial to our business. Agent Y took the live chat and is chatting to the customer. Agent X- cannot see the live chat served by agent Y on his own dashboard. It's possible that their role is set to only show visitors they're personally serving so I would definitely recommend checking there first. Appreciate your help, but unfortunately it doesn't work. Both Agents Y and X can see the orange "SERVE REQUEST" button. I believe it is normal that once a chat request is being served that the bottom navigation is not distracting the remaining agents (that is action-required zone in their mental model). How we monitor ongoing live chats in our organization is under "Visitors" report where an agent may choose to engage site visitors proactively or barge (silently) into ongoing conversation such as Team Leads or similar. thank you. it make sense now.